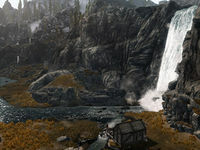 After entering Hjaalmarch, a separate stream from the headwaters also breaks northwest and drops down some waterfalls, eventually flowing into the Karth River just north of Dragon Bridge. This divergence essentially makes an island out of a large portion of Hjaalmarch wherein Fort Snowhawk and several ruins can be found. Fishermen can collect a wide range of fish from the river, including Abecean Longfin, Cyrodilic Spadetail, Histcarp, River Betty, Silverside Perch, and Salmon. People have also been known to make a living hunting for mudcrabs on its banks. This page was last modified on 3 February 2014, at 02:35.